The Israel Law Review is the oldest and most acclaimed Israeli law journal published in English. Since its establishment in 1966 it has become a leading publication in the field of human rights, public law and international law; focusing on law in times of tension and conflict. The Review enjoys a long-standing reputation for excellence, applies a rigorous system of peer review and attracts a combination of established authors and new voices writing on cutting edge topics. 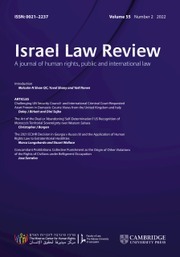 The Israel Law Review is published under the auspices and management of the Minerva Center for Human Rights at the Law Faculty of the Hebrew University of Jerusalem. Under this stewardship, it focuses on scholarship in the fields of human rights, public law and international law and also examines the application of legal norms under conditions of conflict and political uncertainty - highlighting the relevance of the Israeli experience in these fields to other parts of the world and that of other societies to Israel.